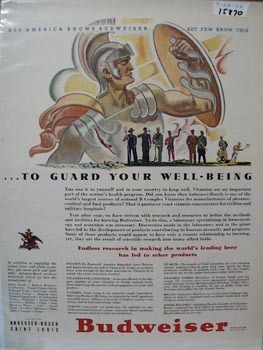 Budweiser Guard Your Well=Being Ad 1942 This is a September 28, 1942 advertisement. It is a nice color ad from Anheuser Busch makers of Budweiser Beer. Pictures many men in different methods of labor and behind them is a vision like Knight with a shield and it reads, To guard your well-being,, Tells how vitamins are an important part of a health program and Anheuser Busch is one of the worlds largest sources of natural B Complex vitamins for manufacturers of pharmaceutical and food products. In mint condition. This photo is taken through plastic and may show wrinkles or crookedness that is not in the ad. This magazine tear sheet measures 10 1/2"" wide by 14"" tall. Items Similar To "Budweiser Guard Your Well Being Ad 1942"
BUDWEISER 1999 20th ANNIVERSARY STEIN W/ BOX **PRICE REDUCED**! !